A turkey called Peas won an online vote to be named the official pardon, and joked that the losing bird "refused to concede and demanded a recount"
After a turkey called Peas won an online vote for the official presidential pardon for Thanksgiving, President Donald Trump joked that Democrats could contest the action. President Donald Trump pardoned a turkey at the White House Tuesday, but not without joking about partisan politics in Washington and around the country. The public was allowed to select this year's turkey through an online vote. Trump said it was "a fair election" but, "unfortunately, Carrots refused to concede and demanded a recount." The joke brought a laugh from the crowd in the Rose Garden. Florida and Georgia recently went through tightly contested recounts. Trump also made a wisecrack about the investigations he faces when Democrats take control of the House of Representatives in January, saying of Peas and Carrots, "I have warned them that House Democrats are likely to issue them both subpoenas." Trump also took a jab at the San Francisco 9th Circuit Court of Appeals, which blocked Trump’s decision to end the Deferred Action for Childhood Arrivals (DACA), prompting lawsuits across the U.S.
“Unfortunately, I can’t guarantee that your pardon won’t be enjoined by the 9th Circuit. Always happens,” the president said. Putting the jokes aside, Trump concluded his remarks by saying that the Thanksgiving period is for unity, love and joy among all Americans. He then pardoned Peas. Peas and Carrots were chosen from a flock of 50 candidates raised on a farm north of Huron, near Sioux Falls. 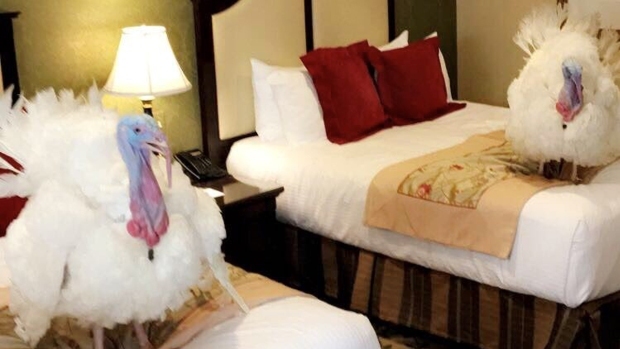 The pair of fowl arrived in the nation's capital Sunday and checked-in to a five-star hotel, the Willard InterContinental Hotel, where they stayed until the pardoning ceremony. Both turkeys will live out their lives at Virginia Tech’s "Gobblers Rest" exhibit in Blacksburg, Virginia. Students and veterinarians within Virginia Tech’s Department of Animal and Poultry Sciences in the College of Agriculture and Life Sciences will care for the turkeys. Former first lady Laura Bush walks NBC 5's Meredith Land through the George W. Bush Presidential Center's recreation of Christmas at the White House. White House archives show that Americans have sent presidents holiday turkeys at least since President Ulysses S. Grant in 1873. But the National Thanksgiving Turkey dates from 1947, when the National Turkey Federation became the official supplier and presented a 47-pound gobbler to President Harry Truman. In those days, the turkeys were destined for dinner. Formal pardons began with President George H.W. Bush in 1989, though stories of spared turkeys date back to President Abraham Lincoln. President John F. Kennedy sent his 1963 turkey back to its farm. Sometime around the Nixon era the White House began sending them to petting zoos after the ceremonies, though without formal pardons.